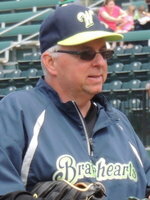 Kevin Hartigan was the longest-tenured coach of the Bravehearts before he stepped away from coaching in the fall of 2017 in order to focus on a position in the front office. He will continue his duties by working with coaches across the country to assemble the Bravehearts' roster. He is a West Boylston resident and retired Worcester firefighter. Hartigan played varsity baseball for Millbury H.S. and went on to become part of Quinsigamond C.C.’s 1979 & 1980 State Junior College Championship teams. He's been involved in community sports programs for over 25 years, including the West Boylston Babe Ruth League and the West Boylston Lions (A Cooperstown Travel Team). Entering his 18th year as a Major League Baseball scout, Kevin has scouted top baseball prospects for teams including the Blue Jays, Reds, and Mets. Kevin also coordinates the team's host family program and is a member of the Millbury Athletics Hall of Fame.